For those couples thinking of eloping, and love Disney then you may want to read on. All-aboard, is the best way to describe this unique wedding elopement package. Michael and Heather booked their dream wedding through Intimate Weddings of Orlando. In fact, Intimate Weddings of Orlando are the top rated Disney intimate wedding planners in Central Florida. Michael and Heathers package included limo transportation by Southern Elegance Limos. Along with a world class photographer Edmund Rhodes from Rhodes Studios. The bride is presented with custom distend bouquet and groom a boutonniere by the talented Flowers by Lesley. The couple was also provided an officiant Harry Rubi from Sensational Ceremonies. 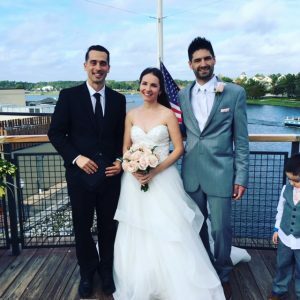 The wedding ceremony and reception location was at Disney Springs aboard the Paddlefish Restaurant. The ceremony was held on the upper deck overlooking beautiful Disney Springs which provided the Disney magic ambiance. The talented team at Intimate Weddings of Orlando designed the ceremony area with rose pedals, and bright white chairs creating an aisle for the bride.